The fabric for Alissa’s blocks (for the 12 Squared bee) has been sitting in my sewing room for far too long, and every time I had a free minute I thought about how I should sew them. There’s something about having to clear the sewing table, detach the yarn winder from the cutting area, etc, that was holding me back, but today I finally vowed to complete them. 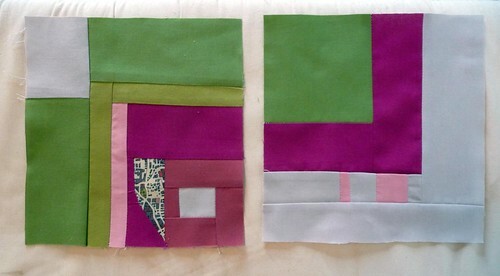 She sent us strips of solids and asked for quarter log cabin blocks. I took the liberty (no pun intended) of adding a sliver of my liberty print to one of the blocks because it just looked so good in there. Hopefully she won’t mind. I forgot how peaceful sewing could be, if only I could get past the initial getting everything cleaned up and ready stage. That’s one thing I like about yarn– all I have to do to prepare is sit down. I can knit or crochet with a veritable rats nest of string and pillows and discarded laundry, mail and shopping bags around me. (I’ve tried this with sewing with some success…but I don’t recommend it). Before I started the blocks I had to allow myself some more squishy fun time with the Blue Sky Alpacas cotton that was leftover from my blanket (yes, I finished. No, I haven’t washed it or blocked it). There are teensy amounts, so I figured I would knit a little baby hat. Right now I’m thinking it’ll be a long, striped stocking cap, but we’ll see how far the yarn gets me. 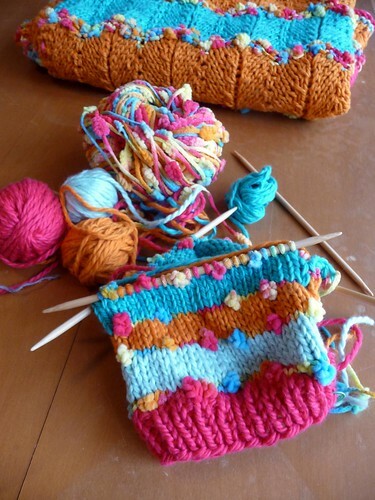 There’s something about this yarn that makes me love to *knit* it– does that ever happen to you? Certain yarns lending themselves to certain crafts? I feel like that’s as good a reason as any to learn to do both crocheting and knitting. I also started another sock yesterday. 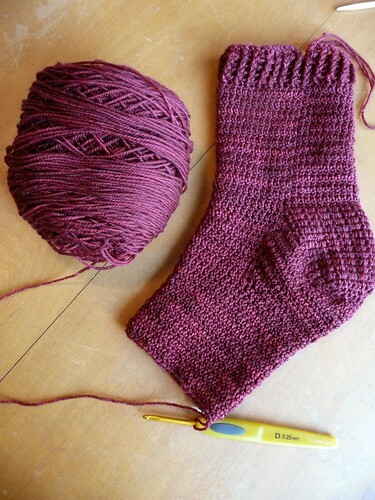 The same sock pattern from Crocheted Socks: 16 Fun-To-Stitch Patterns , this will be pair #4. We just got some yummy Malabrigo in at Yarnivore and I was asked to show off the crocheted sock (you wouldn’t believe how many people have said that they didn’t know you even COULD crochet socks!). I started this yesterday and I’m almost ready to start closing up the toe- how’s that for speed? Needless to say, the Malabrigo is super dreamy to work with and definitely one of my favorite sock yarns. It’s incredibly soft, and comes in such pretty colors. And you know, it’s kind of nice to work the same pattern several times. I hardly have to pay attention anymore, and I know where the tricky parts are and how to modify certain parts so that it fits me better. I probably don’t even need to make a second one since it’s a store sample, but I’m hoping that they will follow me home eventually. Hi, Linda. Thanks for commenting in my blog. I love the color combination of your blanket, btw. Thanks for the photos. That lumpy yarn does amazing things to both the blanket and the hat, doesn't it? I enjoyed seeing your crocheted sock. I knew there was such a thing, but hadn't see a great photo of one, much less a gorgeous purple Malabrigo one in progress! I'm with you on the "doing one pattern numerous times" thing. They go faster and faster because you're in the groove. That works for me when I knit for the Socks for SoldiersYahoo group. wow, that is pretty neat, and I actually hadn't seen it! thanks for sharing!